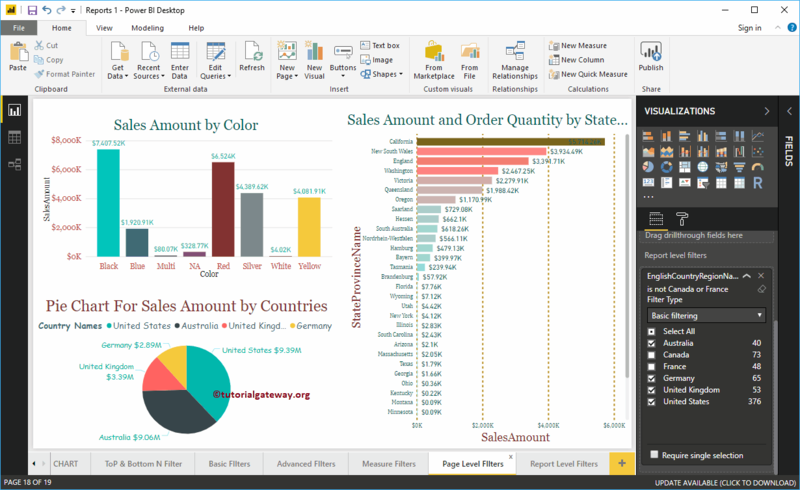 Power BI Report level Filters are used to filter the visuals (or charts) present in all the page of a Report. For example, if your report contains 10 pages then you can use this report level filter to filters those 10 pages at a time. 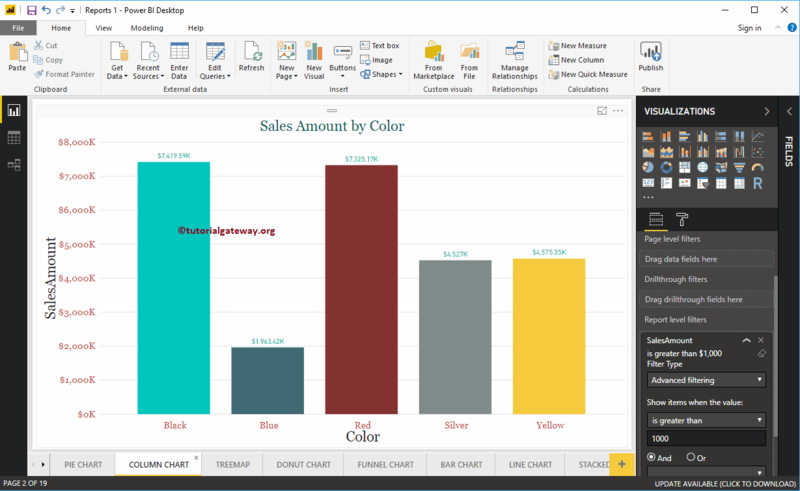 In this article we will show you, How to create a Report Level Filters in Power BI with example. To create this Report (combination of pages), we used the SQL Data Source that we created in our previous article. So, Please refer Connect Power BI to SQL Server article to understand the Data Source. To demonstrate the Report Level Filters in Power BI, we are going to use the Report 1 that we created in our earlier posts. This report has 19 pages: Column Chart, Pie Chart, Treemap, Donut Chart, Bar Chart etc. 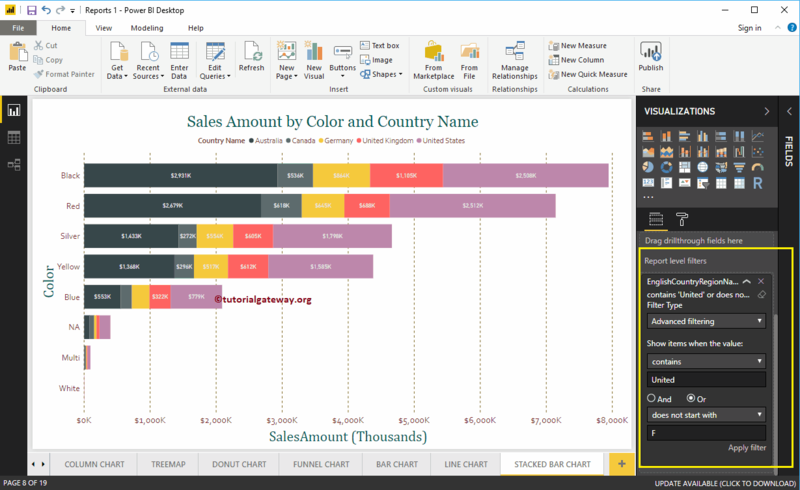 In this example, we will create a Power BI Report Level Filter on Stacked Bar Chart. Remember, this is the 8th page of total 19 pages. As you can see from the below screenshot, we used the Color as the Axis field, Country Name as Legend field, and Sales amount as the Value field. 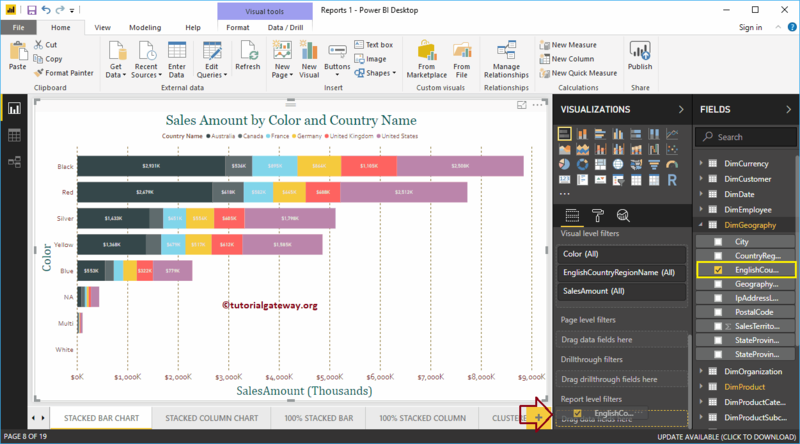 Under the Filters section, you can see the list of available report level filters in Power BI. You have to use the Report Level Filters section to create a filter at report level. Let me drag and drop the English Country Region Name from fields section to the Report level Filters. 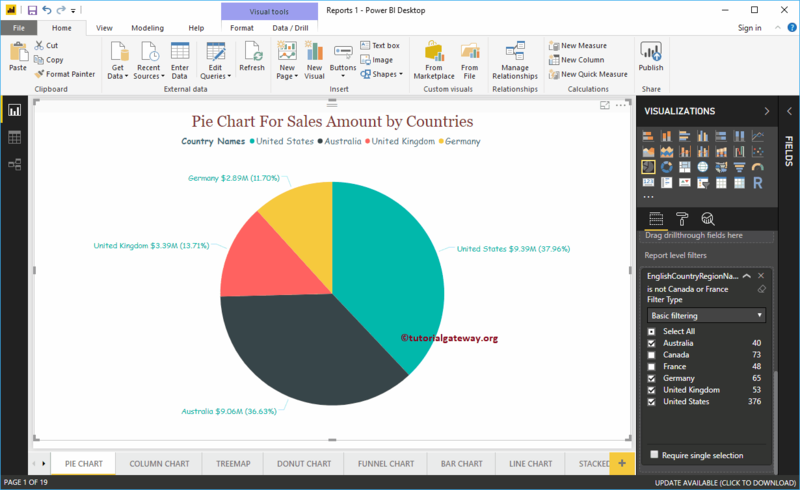 For this Power BI Report Level Filters demonstration purpose, we selected Australia, Germany, United Kingdom, and United States. From the below screenshot you can see that, the Stacked Bar chart is displaying the Sales for the selected countries in a legend. Let me navigate to page 18 of 19. 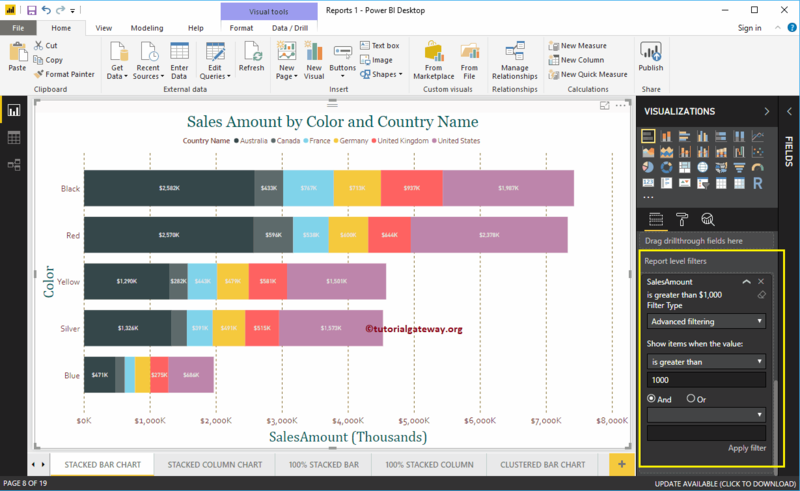 You can see from the below screenshot, Power BI Report level filters are filtering these three charts. Use the drop-down to change the report level filtering type to Advanced filtering. Here, we are applying multiple filters on Country column. First will check whether the Country contains united keyword or not. Or, Second filter will check the countries does not start with F.
Below report is showing the Bars with Countries that contains United keyword, and the countries that does not start with F.
For the demonstration purpose we selected is greater than as the operator, and 1000 the value. From the below screenshot you can see that, the Stacked Bar chart is displaying the bars whose sales amount is greater than 1000.